I walk my dog at the local dog park several times a week. Penelope is a big fan of the wide open spaces, chasing birds, her tail and anything else she can find. One of her favorite things to do is to find a pile of something smelly and roll in it. Good thing there is a self-service dog washing place on the way out. Our faithful friends are entwined around our hearts. This is in honor of all of them. 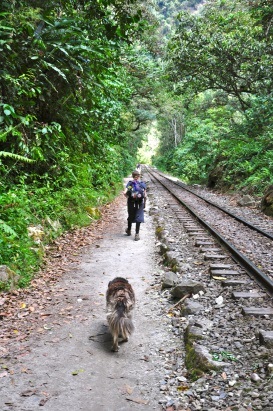 Walking along the tracks, Dawn enjoyed the sun on her shoulders. Hearing a leaf rustle behind her, she turned to look. She saw his fluffy tail heading into the bushes – or was it a branch? She shook her head ruefully. Duke couldn’t resist a good scent or a quick chase. Arriving at their resting spot along the trail, Dawn sat down and reached into her pack, opening a small canister. Ashes and tears floated across the tracks, glinting in the afternoon sun. Lovely and a bit heartbreaking, too. Thanks, Carrie. I appreciate you reading! It is sad that we somehow manage to outlive our best friends so often. Nice tribute. Yes, I’ve been there a few times now. You can’t give your heart without risking a little pain. Touching piece this week. Nicely done. Thank you, Kimberly! I appreciate you reading. Sorry about that! I am glad that it touched you, however. That’s sad. Pleased he got a good send off. So sweet, Erin, and I only mean that in the best possible way. Thanks, Janet. I will take the compliment! It is sad, but life with a companion is so much richer, isn’t it? “… glinting in the afternoon sun.” Very descriptive. There are a more than a few paw prints left in my heart. The last line made me weep. Beautifully written. Thank you, Rochelle. I’m glad it touched you. Oh Erin… do I remember correctly, that you lost your dog last year? It was such a bittersweet, special time when we went to spread our own old girl’s ashes. Such wonderful family members they are, and so hard to lose them! No, I have had Penelope now for almost 6 years. Before that, my faithful friend was Phred, a one of a kind mutt who never failed to make people laugh. They are a part of our hearts. Thank you, Tracey. I appreciate you reading. I got a little choked up on this one, Erin. They aren’t called our “best friends” for nothing. Five stars. You hit the mark with this one. The pain of losing a pet can be worse than losing a human, frankly. As a newbie to the Friday Fictioneers challenge, I’ve been visiting some of the other writers. Your story is sad. It captured my heart as I had the loss of a treasured pet a year ago. I have much to learn about the craft of writing. I feel honored to have found such prestigious ones to learn from.